Your tomato crop may rebound by August. Your loved one may, too. You’ll dig up most of the bindweed. You’ll meet someone new who makes you feel perfect just as you are. The most important lesson I learned in 2014 was impermanence. Bad things are going to happen every single day this year, but life will get better again, and maybe you’ll even learn something new. Good things are going to happen too, but most of them won’t last long. If your expectations include some bad things coming your way and some good things going away, life will turn out exactly as you planned. If you plan for the mildew to hit the squash again this summer – good for you! Things are going according to plan! Much of last year felt like a big failure for me, but I have a feeling I’m going to look back on it as one of the best years of my life. Learning how to grow a successful, organic garden generally takes more than one growing season, just as learning how to love generally takes more than one lover. If your garden didn’t go as planned and you’re anxious about trying again, try again anyway and plan for things to not go as planned. While many of us garden for food and flowers, one of the biggest benefits of gardening is learning. If you garden to learn, you’ll succeed every day. Living life and growing a garden from a place of fear is an easy paradigm to fall into, but it doesn’t have to be that way. Hornworms and bindweed and mildew aren’t threats – they’re teachers. P.S. 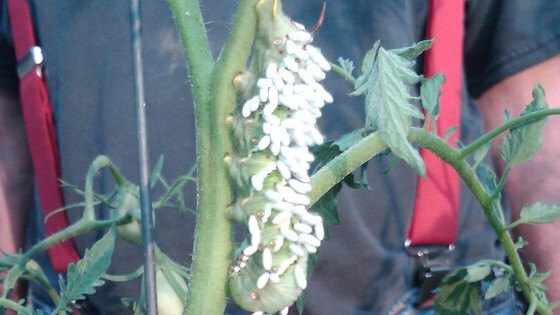 The tomato hornworm larva up above has been “parasitized” by a braconid wasp. The white things are cocoons for the wasp eggs. Larvae will hatch from the eggs and feed on the inside of the hornworm until the wasps are ready to pupate. Then the wasps will emerge, kill the hornworm and go onto parasitize other hornworms. So if you have a parasitized hornworm, leave it right where it is in order to encourage those wonderful wasps. Yes, if you have a hornworm that hasn’t been visibly parasitized, throw it over by the bird feeder or otherwise get rid of it. But if the cocoons are there, try to keep it on your property, even if you remove it from the plant. Good question about hornworm. I mean…overnight. But I love your thoughts abut a fear-based paradigm for life. We all fall victim to fear. But being conscious that it is the fear that holds us back helps to move beyond it. Thanks for the reminder. You are a philosopher and wise for your young years! I so enjoyed this article. Nope! No such thing as failure! Only lessons learned. My biggest lesson was that flea beetles really do like to live in soil that has been tilled rather than in sheet mulched beds! My biggest let down were the seeds I had planned to collect, but couldn’t. Just as the peas were just about dry enough to pick, some animal came over night and ate them ALL. How greedy! The beans I had planned to save for seed, got blight so were not good candidates for seeds, however, I was able to collect some seeds from plants I hadn’t planned on. The melons I dreamed about in spring All failed to produce, but it was the best season ever for greens (the largest leaves I have ever seen) and a bumper crop of tomatoes( a crop I normally have trouble with). Love your article! Positive thinking eh! It is the secret of surviving some terrible times in our lives!… I lost my young son — the only one in September!! He loved gardening!… struggling to make any sense out of this calamity!! So the positive thing is who cares about a few beetles or horn worms… Leave nature take its course! .. its not a LIFE lost but just tomatoes..and veggies. I love this lesson! I’m working to allow fear to energize me rather than paralyze me. I’ve heard someone say fear is excitement without the breath. I’m preparing myself to take an entrepreneurial leap and every time it starts to feel too scary I try to remind myself of this! And that everyday is an opportunity for learning, and I can lean into that curiosity :-). All a work in progress! The melons I planted didn’t do a thing last year. Also, I let some cherry tomato volunteers grow, and they took over about a quarter of my garden. Not expecting them to get so big, I never staked them, which made it almost impossible to step in and around them to harvest — but I did get a lot of tomatoes from them! A cold summer and mice. This was the first time in 7 years we had them. And no hawks. They didn’t show up till late fall. I have no idea where they were. But it was very frustrating. Indeed the mildew on the squash and the leaf spot on the tomatoes are my biggest problems. I’ve tried spraying sulphur – that seems to help somewhat, but only as a delaying action. Eventually the fungus wins. A mixture of “effective microorganisms” and liquid kelp fertilizer can help improve plant health to a point where diseases (and insect pests) don’t come, or at least are less of an issue. Phil, In the 20 years I’ve been gardening in Northeast Philadelphia I have yet to have a season without mildew on the squash. My wife and I have become surgeons cutting out the worm that invades the stem, but they come back and eventually the squash dies. Any remedies I might try? Thank you for the timely encouragement. I was sitting and wondering if it was worth my time, effort and money after last year. I will be pouring over your resources to see what I can improve and try again. I saw my first larva infested hookworm last summer. Having read about the benefits of the braconid wasps I was delighted! However I did remove the hookworm from my tomato plant and placed it gently on the ground hoping the larva would do the deed. You have a wonderful attitude that will sustain you through the hard times. Learning to fail well is one of those important ‘keys’ in life to learn. Kudos. Chickweed it choked out one of my carrot beds I know you can eat it, but the stuff I have would be a 24-7 thing & I don’t really like the taste. Going to sacrifice some the beds & solarize them. Any antidotes for chemicals used on golf courses?I know, you’d need a specific list but…references? My brother has been Director of a public golf course in west suburban Chicago for many years…now, he begins to experience migraine headaches. He might call the folks in white jackets if I ask him to send me the labels of the stuff his personnel apply to their greens…but my suspicion: those are the probable source of his migraines. I’ve seen this before. My advice? Find a new job. That sounds extreme, but it’s better than having migraines. I wouldn’t be surprised if the headaches go away after a few months of being off the golf course, but it’s impossible to know unless he can try it. Thanks- I appreciate your candidness. For the second year in a row I wasn’t getting any zuchinnis growing larger than a couple of inches, then they’d shrivel and die. I googled it finally, because I’m not an academy member, and learned that they weren’t getting polinated. So every day I took the insides of a male flower and wiggled it inside a female flower and had enough zuchinis for the family. I’ve worked on my little veggie patch for three years with many failures until this year. The heavy clay is now a rich friable soil and that alone makes me happy.. Instead of the odd carrot growing I have three full and healthy rows. In total I have five different vegetables and ten herbs and everyone admires my little garden when they visit. I’m learning what works and what doesn’t and apart from food I love the half hour or hour of inner peace I get each day just pottering around or watering in my little patch. Profound observation, Phil. My mentor, Dr. James W. Parker, taught us that you will find some of your greatest losses will become your greatest wins. I listened, and have observed that it is true. I learned that a tomato plant can indeed grow on a windowsill that faces west and gets only about four hours of sunlight per day; it’s currently producing nine fruits. I also learned not to grow bell peppers and jalapenos in the same room as they will cross-pollinate. The bell pepper plant is producing typical peppers, but the jalapeno plant is producing fat peppers that taste the same as the bell pepper – they go just fine in egg salad, but I’m not keeping the seeds of those. Hornworms are also very beautiful in both their larval and adult stages. There area number of species of hornworms. They are pollinators of milkweed, and other flowers. They hover like hummingbirds. This is the Five-Spotted Hawkmoth (Manduca quinquemaculata), the adult of the tomato hornworrm. Yes, they eat tomatoes, but they also are pollinators of beautiful flowers. Below that is another hornworm moth, the White Lined Sphynx Moth. Enjoy! Thank you for your article! True that then everything goes well we learn very little…. There always seem to be something to keep us humble1) I have animals digging in the back yard garden and it is randoom chance where they will dig on the way to the yummy tree stumps. I put a fence around the garden but no luck. I sprinkled lots of cinnamon then hot chili pepper powder with success… until it rained. it’s a creative game… I have enough growing space. They certainly aerate the soil! I try to convince myself that there is something positive about these visitors.2) I just attended an organic conference and noticed that I have overlooked the crop rotation issue – sweet potatoes have been in the same spot the last few years. It is time to draw and really think this one through as well as the use of cover crops… of course not that simple as not all spaces are equivalent and have the same amount of sun in summer and winter… good game! Thank you Phil. So true. It reminds me a book that’s making a great impact in my life. You might enjoy it. Its called the Underachievers Manifesto. Many disappoints and many lessons learned. I give my fears and concerns to my Lord Jesus to carry. He is my peace every day. The trust him. My biggest let down was beets…they never germinated and I tried twice! This year they’re up and growing. Different soil?